This is one of those books I do not want to rate or recommend lightly. This is a book that is both abstract and yet it leaves a definite trail in your mind. Hedon is about a girl of seventeen and her life till she reaches twenty four. 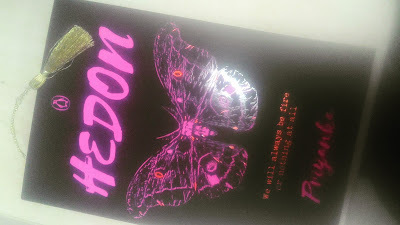 And in those years , between different cities and many adventures , Hedon took me through some of my own friendships and heartache. Hedon follows Tara through her kolkatta schooling , her American college days and then her stay in Delhi. There are things that come to her easily because of her money and status but even then she is as messed up as any one with imagination and a kind heart can be. She is fun, she is free , she is scared and also amazed to be living. No matter what direction the story takes , Even through the pages where I felt a disconnect with the character , i could not stop admiring the writing. Such brilliant strokes of poetry and prose is served in this book. I have narrated and noted some random passages over the last week to friends and totally enjoyed the feeling of "being young" along this book. This is one of the book that I will re read for personal reasons. I am so much going to look forward to next book by the author. This is quirky , lovely , sad , colorful and equally heart-warming even when it talks of heartache , pain and loss - of innocence , of love , of friends and sometimes even places we loved the most.